Stories of discrimination within political parties completely unacceptable. In the month of the 100-year anniversary of women winning the right to stand as MPs, a study published by the Fawcett Society found that women still face obstacles at every stage on the way to Parliament, particularly from ‘gatekeepers’ within the political parties. The wide-ranging research undertaken for the report included interviews with MPs and a survey with 113 MP respondents, analysis of public data on MPs’ careers, and for the first time in over a decade, focus groups with women who aspire to enter Parliament. And it looked at the process of getting elected from beginning to end. The ensuing report, Strategies for Success: women’s experiences of selection and election in UK Parliament, concluded that women still experience multiple barriers to being selected as candidates simply because they are women. Women still meet resistance from local parties who have a preconceived idea of an ‘ideal candidate’ who is white, male, middle-class and able-bodied. And women are still being asked questions about their marital status, their children. Some, the report revealed, were also asked about their religion or belief, their ethnicity or their disability. Many female candidates experienced abuse or harassment from the media, the public and from members of their own partywhen they put theselves forward. And resistance to equality measures was also perceived to be a problem – with some local parties subverting them. On top of that, getting into Parliament requires money, time, flexibility and party networks; and all of these resources are harder for women to acquire. And personal networks and patronage matter more than merit in getting selected – it is still ‘who you know, not what you know’. Women tend to do less well as a result. Men were also more likely than women to have the informal party experience or to have spoken at party meetings or conferences. Party organisation and culture can inhibit women from participating and progressing, particularly at the early stages, meaning they do not get the informal political experience they need. Long and anti-social working hours were cited by a number of MPs as being a problem – including the expectation that you are available to constituents around the clock, and the need to live in two places. The culture of Westminster was also cited as being a barrier. The research also uncovered gender differences when it comes to planning to run. Male MPs were twice as likely as women to have decided to run over 6 months before they were selected for their seat (40 per cent compared to 18 per cent for women) indicating that they are planning their political careers long before women are. Women were also less likely than men to perceive themselves as potential MPs. However, a more positive finding is that asking women to stand does make a significant difference. Women MPs are more likely than men to say that they decided to try to become an MP because someone asked them to. This was true of 75 per cent of women MPs but only 54 per cent of male MPs. And the simple act of a political leader making a call for more women to participate played an important part in individuals embarking on the process of selection. There is support too for party programmes intended to support women in this process. Importantly asking women to stand, encouraging them to see themselves as “MP material” and demonstrating that they are seen this way by their party makes a real difference. These interventions are likely to increase the number of women candidates and help equip them for the process. But a change in representation is likely to require tackling the underlying resistance to women in power, the processes that disadvantage them and other underrepresented groups, and our political culture more widely. The conclusions of the research are applicable to all political parties. 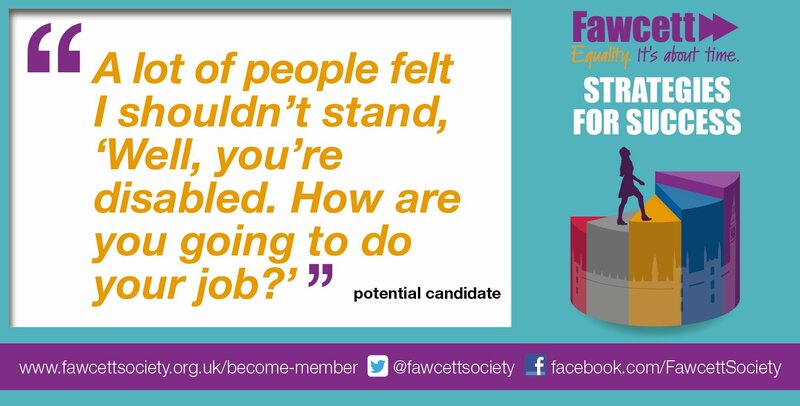 Sam Smethers, Fawcett’s Chief Executive, said: “The women whose voices we hear through this report share stories of discrimination within political parties that are completely unacceptable. Those who lead our parties must confront reality and change the way their institutions work. The Fawcett Society is joining forces with 50:50 Parliament, the Jo Cox Foundation and the Centenary Action Group to hold a number of events on 21 November – the anniversary of the passing of the legislation which permitted women to stand as MPs – and in asking MPs to #AskHertoStand and bring a woman interested in becoming an MP to parliament for the day. Have you asked yours?